If you plan on using a university-supported platform to host your textbook, the first step that you should probably consider is creating an Organizational Account for your text. This provides your textbook its own 4×4 and email address. Whether you’re using Wordpress via create.ou.edu or whether you’re building a static website for which to host your book you will need one of these accounts. In order to obtain your own organizational account visit OU IT’s website and request one. Keep in mind that by default, if you request it, your org. account comes with 50MB of storage space. -request more if necessary. If using create.ou.edu it is not necessary that you request webspace associated with your org. account as space and a domain will be provided through Create. Once your account has been created you may start building your textbook. Recently OU announced that it has subscribed to an Adobe Creative Cloud site license. This means that should you decide to build your textbook website using Dreamweaver you can obtain a license to that software through OU IT. For more information about this, see the OU IT Adobe Creative Cloud page. If choosing to build your site using this method you should at least be familiar with HTML and CSS or at least be willing to learn them. That I know of, the university provides no official templates to use for this sort of thing, but you are more than welcome to download and use the Bootstrap template that I made for the Biochemical Methods Lab Manual. 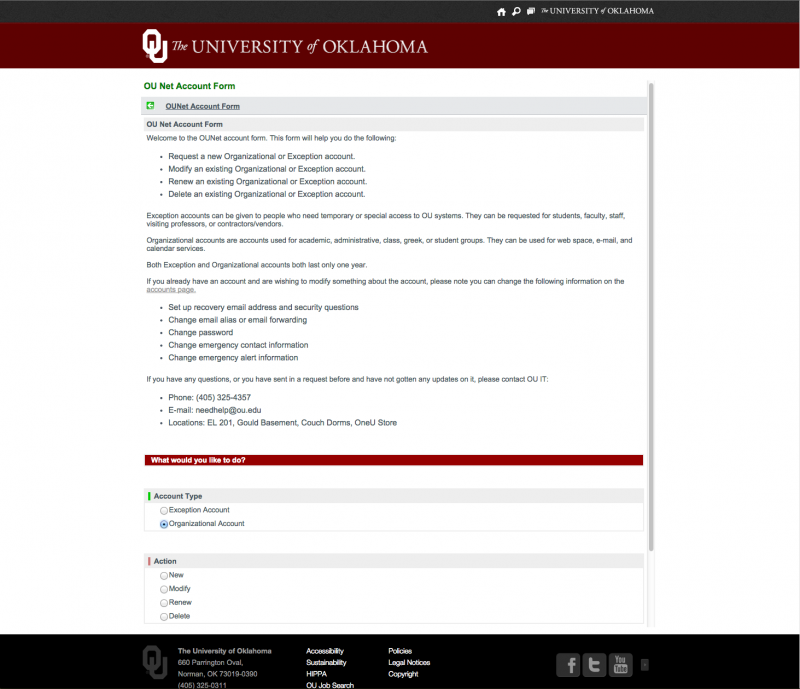 Although I do not know of an official template, I do know that OU Web Communications does have certain guidelines for which to follow when developing a university affiliated website. 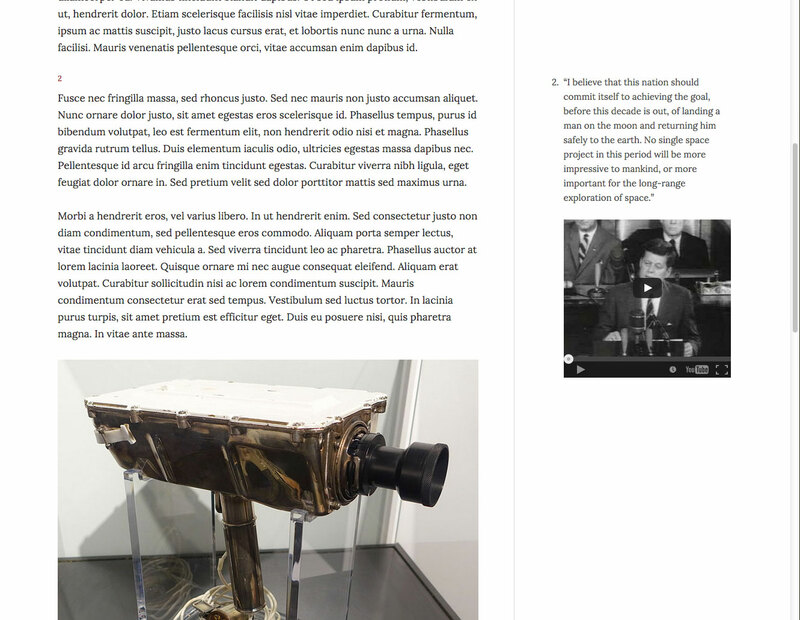 The most basic of these requirements are to include the header and footer that can be seen in the screenshot above. These features are included in the Bootstrap template that we have provided. Other guidelines to make note of are those that explain precisely how to use the University’s logo, its name, and colors. All of this information can be found at the OU Web Comm website. Thus far we have only used static HTML webpages to publish resources that we have developed. One reason for this is that we needed a cross-platform solution, that would display just as nicely on an Android smartphone as it would on an iPad, a desktop computer or on paper. We considered several solutions before deciding on using static webpages as our hosting platform. Others included Apple iBooks, EPUBs, and PDFs, but none were as openly accessible or adaptable as are webpages. Please don’t misunderstand, if you are more comfortable using documents like PDFs or EPUBs to deliver your content through a system such as D2L by all means, please do so; however, know that because our aim is to make your content as openly accessible as possible we may also publish your content in a way that has a broader reach than does posting a PDF to D2L. During this, the second summer of the Open Textbook Initiative, we are taking a new approach to how we develop resources. Last summer we developed two educational resources as static webpages. Not only was this time consuming to do, but it is also difficult to maintain. Our goal from this point forward is to have those in our program do as much of the development of their resources as they are able. That is, we would like to see those we work with maintain as much control of their content as possible. Because HTML can be difficult to work with, we decided to give WordPress a shot as a publishing platform. Using WordPress allows us to preserve all that we liked about using static webpages, but makes the creation process easier. 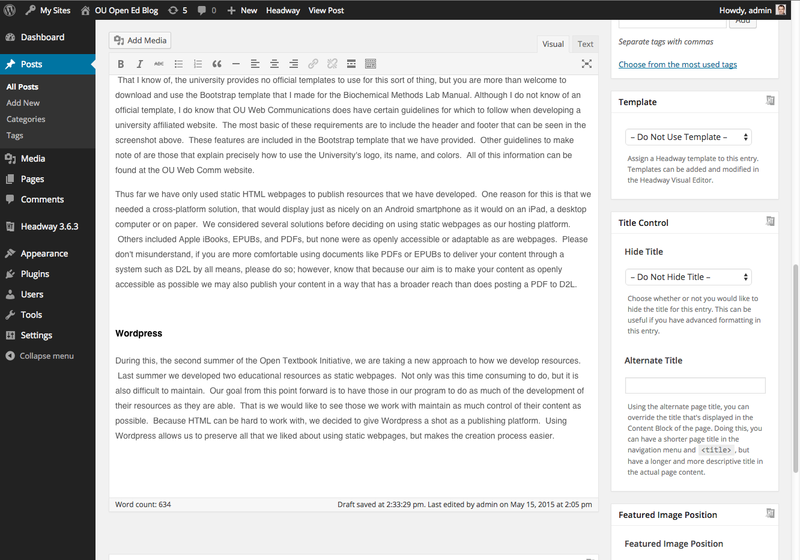 The WordPress editor should not look too foreign. It is quite similar to other WYSIWYG editors that most have used. For most content creation, the ‘visual’ editor works very well; however, in some cases it might be necessary to dig in and edit the HTML that is being generated by the ‘visual’ editor. This can be done in the ‘text’ editor. Because WordPress is typically used as a blogging platform it refers to individual entries as “posts”. In the case of a textbook, posts might take the form of a chapter or a section where each post is its own webpage. Simple WordPress themes can be made to print very well such that sidebars are removed and page formatting is such that it would be display well on a printed page. Modern browsers allow webpages to be saved as PDF documents from the browser’s print dialog box. Using this technique we have met our most basic criteria of publishing with devices of all sizes and manufacturers in mind as well as the option to print. I know I have addressed the issue several times in this blog, but it is worth noting again that we have taken great care to make sure that equations display well in the publishing solutions that we suggest. This is nevertheless true for this WordPress as a solution. I tested three different WordPress plugins that convert LaTeX into beautiful equations. The reason that it took testing two plugins before I decided on a third is a topic for another post itself. The plugin that I decided to use as that which we will support is WP QuickLaTeX. Without too much detail, it handles certain features of LaTeX markup better than the other two plugins that I tested. It also supports TikZ markup which is capable of rendering graphs, circuit diagrams, and chemical structures to name just a few of its capabilities. This summer we are supporting Dr. Eli Bridge to write a Physiology textbook. During our initial discussions he mentioned that he would like to be able to make comments and interjections throughout his text very much like footnotes or references, but if those were listed directly beside the text they reference. After our initial meeting I began searching for a solution for his request. Dr. Bridge, prior to our suggestion, had already decided to write his open textbook in WordPress, so naturally I began searching for a WordPress plugin that implements what he was looking for. What I found is a plugin called SideMatter. SideMatter requires a theme that includes a right sidebar inside of which the references are to be placed. To insert a reference using this plugin simply wrap the text you would like to appear in the sidebar in [ref] [/ref] tags and when the page is rendered that text will be extracted and shoved to the side of the page and vertically aligned adjacent to the text which it refers to. We have found that links, images, and videos can be inserted into these references as well as plain text of course. Two things to note when inserting videos is that videos will need to be resized by editing the embed code’s attributes when inserted. Additionally you must wrap the embed code in its own division ( <div> . . . embed . . . </div> ) to make it show up at all in the sidebar. -at least that has been my experience. So far this summer, these are the solutions that we are working on. There are surely more to come. We look forward to working with those who we support and are eager to learn of the innovative features they demand of their publishing platforms.